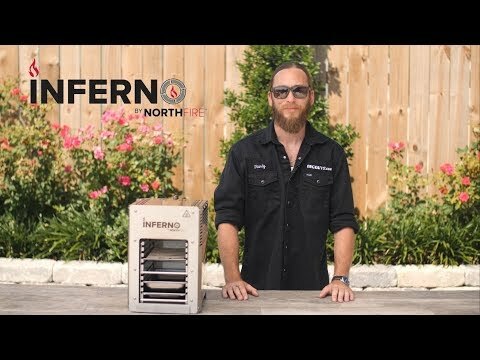 Experience a new innovation in infrared grilling with the Inferno Grill by Northfire. This German crafted grill features an infrared burner that quickly heats to 1,500 degrees Fahrenheit for perfect searing within minutes. While the Inferno shines when grilling steaks, it is not limited to only steak. You can also cook chicken, lobster, fish or even veggies. The simple push to start ignition gets the grill going quickly. When you are done grilling, all the interior stainless steel components slide out and go in the dishwasher for easy cleaning. The Inferno grill has a small footprint, making it ideal to take to the tailgate, campsite or even the beach. The Northfire Inferno gas grill is warranted to be free from defects in material and workmanship for a period of one (1) year. What is the difference between this product and the Beefer Original? This one says infrared burner and Beefer says ceramic burners. I'm not sure what the difference is? Are the burners on this ceramic? Hello Steak Whisperer! I'm not certain the differences between this unit and the Beefer Original, as we do not carry the Beefer Original. 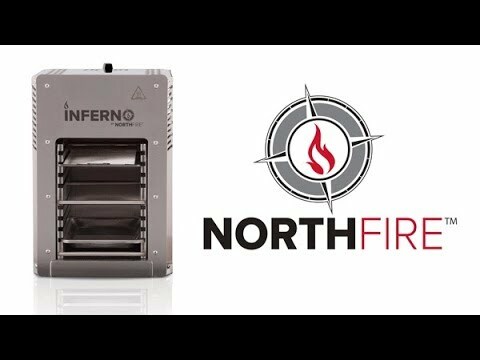 However, this Inferno by Northfire has an 8,500 BTU ceramic infrared burner that can reach temperatures up to 1500 degrees Fahrenheit. What propane connector does this use? Hello. The Inferno includes a hose and regulator for standard 20 lb propane tanks. What are the dimensions of the cooking grill area? I have been looking for overhead infrared propane grills for home use and found Otto's OFB (Over Fried Broiler) and Beefer Overhead Infrared Propane Grill that interested me , both are well made grills but way out of my price range. I just now found your listing for a Inferno by Northfire Portable Infrared Propane Gas Grill which appears to be a quality grill that is more reasonably priced. Would parts like a burner be available should a burner fail? I feel that infrared grills with overhead burners would be much easier to clean that grill where the burner is below the grill? Hi, Tom. The cooking grill's dimensions are 11 in. X 6.1 in., which gives you 67 square inches of grilling area. The infrared burner in a broiler probably would be easier to clean, however, infrared burners get hot enough to burn off and vaporize drippings, so they tend not to get very dirty. With that said, should the burner or another part fail, contact us at 877-743-2269 and we'll work to get the part you need.